A chat/bs/what have you thread for anything and everything related to the original first gen air cooled HM. What a good idea. Since there is no chance at all for a separate forum, and so many of the air cooled folks have left or just stopped posting. It could also serve as a sort of roll call to see how many followers of the one true Hyper are left. I would suggest however that no time or effort is spent bashing that other fine machine that shares a name and nothing else with our near perfect motorcycles. I'm looking forward to watching this thread and seeing where it goes. Interesting idea. There's a similar split/discussion going on in the Harley camp right now that I'm following. Loved it for what it was, and its less than perfect abilities made it A HYPER. then they mess with the cases and make it lighter? Still as strong ?They say??? Want to hear some whining ? Talk about the demise of the ST's. Take my Advice, I don't use it. If I want to hear whining I can just listen to myself. I try not to be bitter. I don't manufacture motorcycles, I just try to find ones that fire up that part of my brain that says "Oh yeah, that's the stuff". The Hyper does that. Every time. For almost 7 years now. I've owned faster, more comfortable, way more complicated bikes, some of them I got rid of before the first tires wore out. I had hoped that with the arrival of the 4-valve there would be piles of 2-valve Hypers laying around for fans like me to pick up for a song. Didn't happen. The few I see for sale seem to be made of gold judging from the prices. Nevertheless it is my goal to own one of each of the 2-valve Hypers. They don't take up much room in the garage. I'm trying to talk a friend into selling me his 796 now and I will find a '12 evo this fall when the weather closes in. I have been a dirt bike rider since I was six. But fell in love to a Ducati machine for the first time in 1991 when I saw an article abot the 900SS and the legendary Massimo Tamburini 750 Paso. 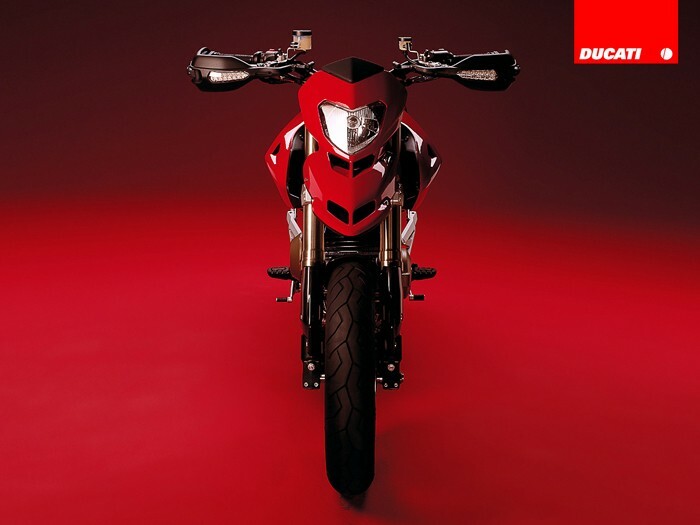 I could not afford a Duc on those days but the love seed was already planted, and when the hypermotard made its appearance last decade, I was convinced that the perfect motorcycle was born conceived by the genius of Pierre Terblanche. I am the kind of guy who is so involved with work and everyday stuff, that misses a lot of things that happen around. So, when I finally got enough money to buy my HM this year, it came as a surprise to me to find out at the Ducati dealer that it was not the bike I had been dreaming on: Liquid cooled, wet clutch, more power but less torque, and the worst part: Not Pierre Terblanche's design. I read all existing reviews of both HM generations in order to make a good decision. I finally took a stand considering that 1) This is my first Ducati, 2) The bike is intended to stick with me for many years, and 3) Nobody knows what will happen in the future, so if this was going to be my "only" Ducati, it had to be a legendary model. So I started my quest looking for a 1st gen HM with low mileage and I found one: A 2008 1100S with 10,000 miles on it and in really good shape. The only thing missing are the mirrors-handguards and it has a non OEM lower seat with a red stripe on it. The looks of the bike are better in my opinion with the original seat. As I have some extra bucks left, I am investing in buying the DP handguards and mirrors, the original seat and some subtle mods trying to keep it as close as possible to the original design (Example: I love those exhaust pipes beneath the seat so I wont get a 2-1 exhaust system). What is it you love the most of the 1st gen HM? How far can you go with a full tank? I am planning a trip and there is a 200 miles section without gas stations. Is there a risk of not making it? I know, right? Who does this guy with a 2nd gen Hyper Evo think he is starting a thread on the best Hyper? Depending on your right hand you will get between 90 and 120 miles before the low fuel light comes on. 200 miles? no way, unless you coast half the time. You say you have some cash left over? You need the California Cycleworks fuel tank. 6+ gallons-250-300 mile range. $900. is a lot but it beats pushing it the last 50 miles out of the desert. Of course you can do what many of us did, strap a couple of gas cans on the back and not worry about it. Two months ago I bought my first road bike a 2011 HM1100 with 2000 kms . Lke a lot of HM owners I have been riding off road since I was 6 years old and I felt uncomfortable on a road bike .The thing that drew me to the hyper was the upright riding position,dry clutch,twin exhaust and the idea that this bike is different but when I took it for a quick ride the truck loads of torque sealed the deal. I have purchased some bags and plan on using this bike to commute and travel around parts of Australia (home) on. We'll see how well that works out ? I have no ill feelings towards the new hypers I'm just happy to see there are other first gen owners around that can offer advice and stories of their rides. 2011 hypermotard 1100 Evo. Remus exhaust , tuneboy , carbon stuff. Good point and hopefully bring some of them back. Thanks for bringing this up early on. I agree 110%. Doesn't seem like it. From what I've seen and heard, the owners of these bikes are dedicated to them, understand them for what they are and have no reason to change because of it. it is my goal to own one of each of the 2-valve Hypers. Spoken like a true HM enthusiast! That is quite the goal. when the hypermotard made its appearance last decade, I was convinced that the perfect motorcycle was born conceived by the genius of Pierre Terblanche. I know exactly what you mean! To this day, there is not is not one particular bike out there that has lit such a burning fire inside me as the original Hyper has. I remember seeing one in the flesh for this first time at the Seattle IMS show and just feeling the adrenaline coming off it when looking at it. Don't get me started when I sat on it. I wasn't in the position at the time to own one but made it a life-long goal to. A few years later and I can now say that I've owned two! I understand where you're coming from and without a doubt say that you made the right decision. The first gen, arguably, is more legendary as you state with the dry clutch, air cooled design, full front and rear trellis frames etc. Good. When it comes to the factory mirrors/handguards, you either love them or hate them. There is no in between. For me, the foldout mirrors are one of the distinctive traits about the these bikes and without them just doesn't seem or look right. I love those exhaust pipes beneath the seat so I wont get a 2-1 exhaust system). Aren't they one of the neatest factory exhaust systems?! The majority of bikes these days simply come with a big old ugly factory can that is simply there to serve a purpose with no design built into it. The factory exhaust on these bikes was actually built into the design of the bike! How often do you see that on bikes these days? Not often. Sometimes I do wish I had the factory system on mine just because it does look so cool! Call me crazy but I'm considering making a display of mine and putting the tail section inside the house and calling it "art." Good question. Well I wouldn't know where to start but I think the best way to answer it would be how it makes me feel. It gets my blood pumping like no other bike has done before. Not much over 100 miles. You will have to get a larger tank to go that distance between stations, without a doubt. I'm just happy to see there are other first gen owners around that can offer advice and stories of their rides. Congrats on the new bike and hopefully before long you'll be able to share some stories of your own with the HM!